Travelers can partake in the latest travel trend at Grand Velas Riviera Nayarit with its new Adrenaline-to-Zen Extreme Adventure Experience. Travelers can partake in the latest travel trend at Grand Velas Riviera Nayarit with its new Adrenaline-to-Zen Extreme Adventure Experience that features high-octane activities combined with the resort’s renowned spa. The adrenaline rush adventure is followed by a relaxing zen activity, resetting and quieting the brain for the ultimate blissed-out experience. After returning to the resort, guests can soak up scenic sunset views of the Banderas Bay or visit the spa for unlimited access to its hydrotherapy journey. The hour-long journey features a eucalyptus-scented steam room with chromotherapy, a bi-thermal pressure shower, peppermint ice fountain, hot and cold lagoons, sauna, hydro-reflexology, and Jacuzzi. 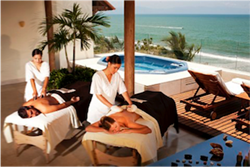 One couples massage is also included in the package. Rates for the Extreme Adventure Experience start at $912 USD per person per night, inclusive of VIP airport pickup service (Airport-Hotel). The Grand Velas resort’s all-inclusive rates always include luxury accommodations, a la carte gourmet meals at a variety of specialty restaurants, premium branded beverages, 24-hour in-suite service, taxes, gratuity and more. For reservations or more information, call 1-888-407-4869, email reservations(at)velasresorts(dot)com or visit http://vallarta.grandvelas.com/. Grand Velas Riviera Nayarit, a Leading Hotel of the World, enjoys a privileged natural setting with flowering, landscaped gardens beside a long stretch of pristine beach and a dramatic backdrop of the Sierra Madre Mountains. The centerpiece of the gardens is a three-tiered infinity pool, a preferred spot for catching the legendary sunsets. The AAA Five Diamond all-inclusive resort features 267 ocean-view suites, some with private plunge pools, and all with plasma TVs, wireless internet access, fully stocked mini bar, L’Occitane amenities and Nespresso machines. Of the resort’s five restaurants, three, serving French, Italian and Mexican gourmet cuisine, have received AAA Four Diamond awards for distinguished cuisine and presentation. An oasis of wellbeing, the resort’s Leading Spa of the World offers 20 treatment suites, more than 30 spa treatments, many inspired by the native traditions of Mexico and a signature water journey. Other features include a fitness center, 24/7 in suite service, water sports, business center, tennis, baby concierge, Kids Club, and teen lounge during holidays. Puerto Vallarta is just a 15-minute drive away. Grand Velas Riviera Nayarit features more than 25,000 square feet of indoor meeting facilities, including the Grand Marissa Ballroom, which consists of more than 6,000 square feet and is easily subdivided into five separate rooms. The resort’s facilities also include four other rooms ranging from 681 to more than 1,954 square feet that offer several arrangement variations to maximize meeting productivity and efficiency. The resort has won numerous awards from Condé Nast Traveler, Travel + Leisure, TripAdvisor, U.S. News and World Report and Forbes, which named it one of the Top Ten Coolest All-Inclusives in 2012. Grand Velas Riviera Nayarit was built and is operated by Eduardo Vela Ruiz, owner, founder and president of Velas Resorts, with brother Juan Vela by his side, vice president of Velas Resorts.